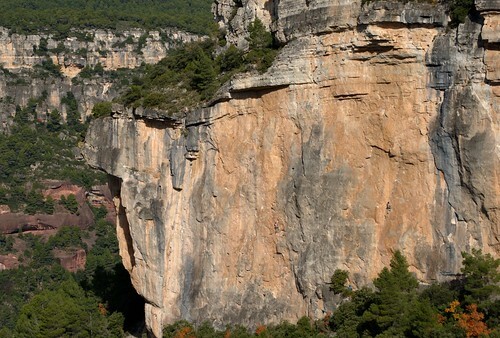 Can you recommend some crags with nice routes between 6b and 7b (Siurana or elsewhere in the near) that are orientated to the south and get enough sun? I think we will need this in december…. The fact is that there are plenty of south facing crags with excellent routes in that grade-span in the Siurana/Costa Daurada-area, making climbing possible during the whole winter. With a little sun and given that the wind is not to strong it might even be possible to climb in t-shirt in December. Today, 15th of November, it was actually too warm for me at the El Falco crag of Arboli. 22 C in the shade, probably 35 C on the wall. February last year we were climbing in t-shirt in Raco de Missa when it all of a sudden started snowing! Climbing is truly possible in the winter in northern Spain. 40 routes from 6b to 8a. Some of the routes are long and require at least an 80 meter rope. The Siurana-guidebook covers this sector. Raco means corner in Catalan and this little corner of Montsant is an excellent choice for winter. Head up there in the morning, shade comes maybe around 16:30. The crag holds 80 routes from 5 to 8b+. Best range from 6b and up. The routes numbered 27-29 (and many others) are just fantastic. This is a world class sector. Just one of many super-sectors for the mid-range climber in Margalef that can be enjoyed in winter. The sectors just by the side of it, above the ermita (little church), offers beautiful climbs in the 7th and 8th grade. Tagged with costa daurada, travel tips, winter crags.